Are you happy with your current crypto portfolio and wish to sell all of it for USDT or BTC in one go? Well, you can do so quickly by following this guide and using our favorite bot called 3Commas. If you do not use bots for trading, you are missing out. Just like the cryptocurrency industry, these bots are in their infant stages. And if you one of those who started trading cryptos in the past 2-3 years, learning about these bots will help you make the most out of crypto trading. To top it all, you don’t even need technical skills! Sudhir has already talked about 3Commas in our earlier blog post. 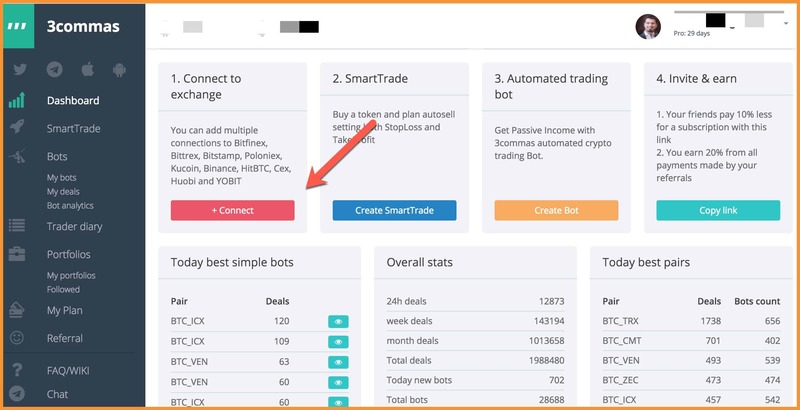 Therefore, in this new series of posts related to crypto bot trading, I will explain how to use it for different purposes. The first in this series is how you can use 3Commas to sell all your cryptos for Bitcoin or USD(T) at once. For this tutorial, I have connected my Binance account with 3Commas using API. If you don’t know how to use it, I will show you how to do that in an upcoming video on CoinSutra’s YouTube Channel. For now, I shall assume you know how to do that. Select the exchange you wish to add and give it a name. Using 3Commas, you can add as many accounts of exchanges as you want. Once you have connected an exchange account with your 3Commas account, click on your email at the top right and click on My Exchanges. Here, you will see the list of all connected exchanges. Now, with one click you can sell all your cryptos on an exchange for Bitcoin or USD(T). Depending on the direction the market is headed, you can sell all your cryptocurrencies on supported crypto exchanges for either of USD(T) or BTC. Later on, you can use the Portfolio feature of 3commas to buy back all the coins according to your portfolio. Portfolio diversification and rebalancing are two significant features that you must use to enhance your crypto portfolio. For example, on 3commas you can copy the already built and well-performing portfolio. Once you have copied the portfolio, you can use the rebalancing feature to rebalance it after specific hours automatically. I’m still exploring 3Commas, and so far it looks really handy. The only challenge is learning everything that it has to offer. You can expect an article or a video as and when I come across a usable feature. I would highly recommend you to join us on YouTube as some of these tutorials are much easier to grasp by watching videos. 3commas is not a free service, but they offer $10 as joining bonus that you can use for initial testing. Overall, it will help you make more money and more importantly, gain experience. Also, let me know if you have tried other automated tools for cryptocurrency trading. Nice one Boss. But how much does it cost to trade with the real bot without the $10 bonus?